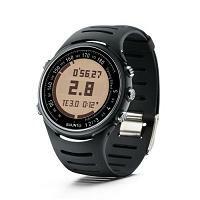 The Suunto T3 heart rate monitor is an intermediate heart rate monitor. Compared to the T1, it introduces a feature called Training Effect, which allows you to monitor your aerobic performance real time. It uses also digital transmission to reduce/remove interference. It comes in various colors, so the image you see on the right is not the only one available for sale. Important Note: There are more recent revisions of the Suunto T3 heart rate monitor. The Suunto T3c comes with the new comfort heart rate belt whereas the Suunto T3d comes with the new dual heart rate belt instead. This means that the T3d dual chest belt can provide either interference free heart rate monitoring, or if required, interface with cardio gym equipment via analogue transmission. So if you are buying new, it is probably better to choose Suunto T3d to take advantage of these new enhancements. You can also set up 3 heart rate training zones. The default is zone 1 (60 to 70% Max HR), zone 2 (70 to 80% Max HR) and zone 3 (80 to 90% Max HR). Optional PODs (not included in standard package) to give the Suunto T3 heart rate monitor other capabilities: GPS POD, Bike POD, Foot POD and PC POD. Note that the features in bold above show the features found in Suunto T3 but not in Suunto T1. Training Effect: This feature is quite unique. Using your personal fitness profile, the Suunto T3 heart rate monitor analyzes your heart rate performance and displays that on a Training Effect scale between 1 to 5. It tells you bascially how much your current work out has improved your aerobic condition. If you want to maintain your aerobic fitness, train until your TE measures 2.0 to 2.9. If you want to improve it but not at too quick a pace, train until it measures 3.0 to 3.9 and so on. You can also (if you wish) pre-set your training target before your workout. Overall the Training Effect feature is great for many people who want some guidance on whether they have trained enough to achieve their aims. Optional PODs: There are 3 types of PODs (Peripheral Observation Devices) for speed and distance measurements: GPS POD, Bike POD and Foot POD. If you use one of them, you can set your speed limits and also review your speed and distance information real time and also in summary. In addition a number of other facilities such as Autolap etc become available. PC POD enables data download directly from your chest belt to the PC, allowing real time monitoring of your heart rate on the PC screen. The T3 wrist watch unit can also connect to the PC via the PC POD. The PC POD comes with a special monitoring software. The two major features brought in by the Suunto T3 heart rate monitor are Training Effect and digital transmission. For runners, the Suunto T3 now records more laps (50) and comes with an interval timer. It can now remember data from your last 15 sessions, whereas the T1 can only remember 1 session. Furthermore, the ability to interface with the various PODs makes the T3 potentially a very powerful heart rate monitor. Reviews: This page has a concise summary of Suunto heart rate monitor reviews. Further information: Visit Suunto's official web site.